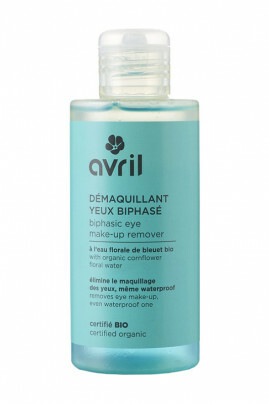 Thanks to its not greasy two-phase texture, Avril Organic Two-phase Eye Makeup Remover is ideal to eliminate smoothly the make-up, even waterproof ones. Its bi-phase formula is rich in organic cornflower and camomile flower water to soothes sensitive skin and contact lens wearers. Une cata!!! Me pique se brule les yeux c est inutilisable ... pour une première commande laborieux c est une honte de vendre ca..
Strong against waterproof makeup ! Shake before every use to mix well the two phases. Put a cotton cleansing pad soaked in Vegan Avril Eye Make-up Remover on each closed eye, let proceed a few seconds then slide the cotton from top to bottom of eyelashes. AVRIL Vegan Eye makeup Remover contains 98% of natural ingredients ! Évidemment c est une ou zéro étoile mais le commentaire précédent ne peut se modifier ! !